DIN Time is a clean, glanceable, watch face available for the Fitbit Ionic, Fitbit Versa and the Pebble Smartwatches. The watch face is based on the DIN 1451 Engschrift typeface. Time is aligned along the right or left side so it will always be the first you see when you pull up your sleeve to glance at the time. 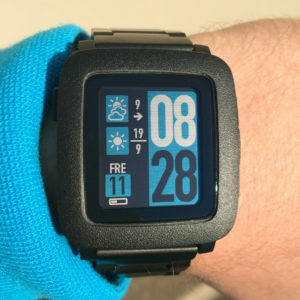 On the Pebble platform it consistently was in the top 10 of most liked watch faces, currently it holds #8, with nearly 80,000 installs. Time in big, easy to read, DIN Engschrift. Preset themes and share theme colors with other users! Layout options for left or right-hand use, so you can glance in any way you like! Most parts of the watch face can be hidden. Weather, provided by Yahoo, with custom icons and temperature in Celsius or Fahrenheit. Forecast (in dashed box) with expected high and low temperature for the day. Tap the stats box for even more weather data. Day of week in many languages. Bluetooth disconnect warning (with optional vibration). Optional periodic vibration every 60, 30 or 15 minutes. Quiet time (no vibrations) between set hours. Fully customizable colors on color Pebbles. DIN Time for Pebble is free to download and use. I have spent hundreds of hours on DIN Time, I had to learn the programming language from start, and released more than 15 versions since March 2015, each one adding features and improvements. If you appreciate my work and want to say thanks please consider donating. Please use the support contact form or send me an email using the Contact Developer links on the respective platform. But please check the FAQ first! DIN Time is available in the Fitbit App Gallery (this link only works from the mobile phone with your Fitbit app) or from the Pebble App Store. Nice watch face, but the weather isn’t updated regularly. I’ve set update weather each 30 minutes, but period is mush longer and some times I need to go to the setting and push them to the watch to start weather update. Just want to say THANKS and looking forward to see the steps showing in the DIN TIME. You make my Pebble perfect. I love thus watch face! Thank you! Big thumbs UP for you! this is the best watch face on Pebble store, period. I’ve tried many, but every time I go back to DIN Time. Waiting for health options. Thank you! Health is there, since a about two weeks. Shake your watch twice! Great tine app for Pebble. Have tried many others and always came back. Health is great but i have two suggestions for further improvement: enable switching black on white for better readability and enable switching from time to time by pressing button rather the double flicking. This would enable to read the massive amount of information better. When done i will certainly donate. If you mean inverting the screen on black and white Pebbles that is already possible. Check below the preview image in the settings page. If you mean for color Pebbles you can load one of the many color presets. There’s a black and white there. As for using buttons to invoke actions that’s not possible in watch faces. You can already set colors for the pop-up in the weather settings dialog in the settings page. In the next version you will be able to set the time for how long the pop-up will be shown, but as I said buttons don’t work in a watch face. Phantastic, i was not aware that this also can be defined. For the switching of pages would it also be possible to leave the health display till the next double shake? That way everybody could take as much or less time for the health display as required. It’s a very nice watch face, especially looks good on Pebble Time Round. Thank you! Would it be possible to keep the compatibility with FW 3.14? Thank you! No, it’s too much work keeping two separate builds. I’d you don’t upgrade your firmware I think you should still be able to use the last version built for that firmware though. This is my preferred watch face for my Pebble! However, with the latest 4.0 FW, the timeline quick views are overlapping the minutes when they are displayed. Are you working on reacting to these quick views? Yes, I plan to adapt the time display to Quick Views. I searched a lot, but all I tried, missing something. DIN TIME is simply the final touch that needs a Pebble Time Steel. Thanks a lot, this is a great job. DIN Time is my Go To watchface on my PTS. I love it. Thanks so much! I’m glad to hear that you will be implementing Timeline Peek. I want to see the pop-ups, but not being able to see the time fully when one is on the screen is driving me nuts. Any ETA on when Timeline Peek will be ready on DIN Time? Hiya! I have been a Pebble woman for a couple years now (& yes, sad about the recent recentness). I have been looking for a reliable watchface with the “Real Feel” temperature since I (super excitedly) got my Pebble Time. I would always search, “real feel”, “wind chill”, “humidity” & “humidex” in the app store, with very little luck. I just found this one by clicking on a photo I saw of the watchface, because I liked the way it looked =) Just a wee suggestion ~ put those keywords in for searching, if you can. The watchface is poifect. No suggestions for that! hehe. It seams the pebble servers have been shutdown. So I can no longer get the watch face. It is the one I use, but my watch reset and now I only have the defaults. Do you plan to publish the binary so we can side load the app? The app store servers are still online. Please check again and make sure you have the latest version of the Pebble app. It got updated last week. But if the servers eventually goes down I will host the binary here. Interesting, I can not even do a search, and when I click on one of the items on the first screen it just times out. Even the links to the DIN watch face that I have found will open the pebble app but then it times out. I am using iPhone by the way. Yeah, sorry, I noticed this too now. We’ll give it a few hours and if it doesn’t resolve I’ll arrange the file for downloading here. It’s been like that for at least a week. Its odd that the initial page works and appears to update but nothing else works. Deleting and reinstalling the app fixed the problem for me. Deleting and reinstalling did it for me to. Thanks. Was quit worried when everything suddenly dissapered on my first holiday. Now happy again. i think you did a good job. I have your DIN watch face as my favorite. It is good readable and i see all information i need. Hi, and thanks for your fantastic watchface! Any chance that this could work with DIN Time…? Thanks, I will look it. I use this watchface since I owed my first pebble a couple of years ago. I will have to look into it, but I don’t see why it shouldn’t continue to work with the Pebble app after there server shutdown. Gadgetbridge is another thing. As I understand it they need to adapt gadgetbride to DIN Time, not the other way round. Ok, I will wait what happens when pebble actually goes offline. I tested gadgetbridge and it seems to work, except for configuring settings. Thank you for creating and sharing this great watchface! where can i get it? how much it cost? DIN Time is available for Fitbit smart watches from the Fitbit App Gallery in the Fitbit app on your phone. 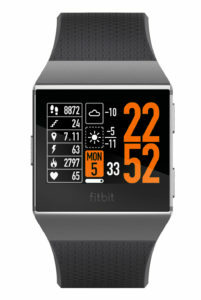 Direct mobile link: https://gam.fitbit.com/gallery/clock/34843098-23c0-47c0-a07c-c7bca48557f7 It is also available on Pebble smart watches. It costs $1.99 for Fitbit and us free for Pebbles. Hi Christian. Thanks for din time. Weather stopped updating for months now. It always shows 4 celsius. I’m on a Pebble time steel. Android 9.0 on galaxy s9plus.